On this day in 1890, hundreds of Lakota people were massacred at Wounded Knee creek in South Dakota by the 7th Cavalry of the United States military, commanded by General Miles and Brigadier General John Rutter Brooke, whose papers I recently processed. Brooke is rarely associated with Wounded Knee in the way that General Miles is, but Brooke worked on the ground from the Pine Ridge Agency, and fed Miles much of the information upon which his policy was based. As I was processing the John Rutter Brooke papers (collection #78) a few months ago, I found that this collection contained an extremely detailed account of military plans and actions in relation to the Lakota/Dakota Sioux people who lived within the Pine Ridge and Standing Rock agencies in North and South Dakota. 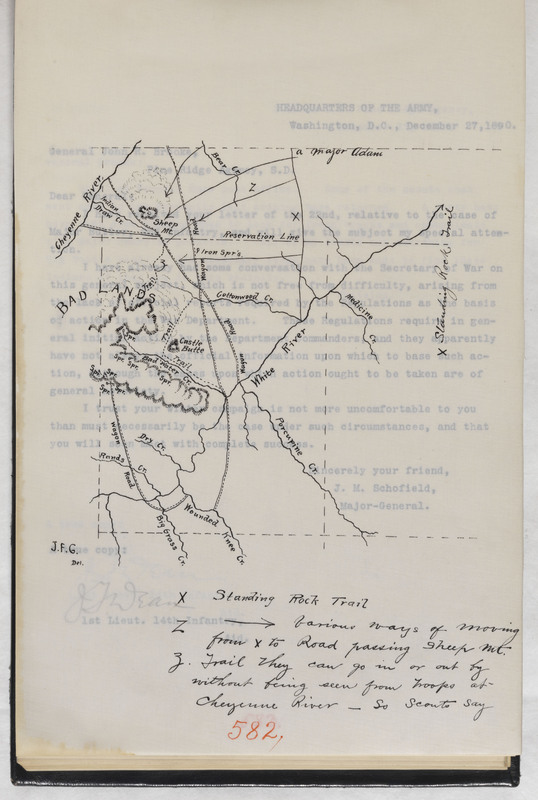 I believe that these papers might lead to a more detailed understanding of the military campaigns in the Dakotas, and will certainly illuminate Brooke’s role in these maneuvers. The communications about what Brooke dubbed the “Sioux Campaign” begin during the spring of 1890, in the form of telegrams between military commanders and operatives. 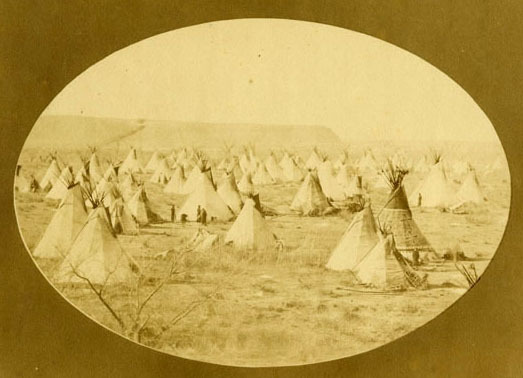 These telegrams trace the strategies developed by the U.S. military to deal with the “Ghost Dance religion,” which they perceived to be an escalation of force on the reservations. The United States government declared Lakota religious rituals illegal in 1883, and were putting pressure on the Lakota people to stop the dances. Sitting Bull refused to cooperate with the military, and was finally murdered on December 15, 1890 during an attempt to coerce him into surrendering. Sitting Bull’s murder was only the beginning of the military escalation in the Dakotas. The weeks leading up to the Wounded Knee massacre saw a massive buildup of troops within the Pine Ridge agency as they attempted to capture Big Foot and his followers. Accounts of the massacre at Wounded Knee offer various estimates about the number of Lakota people who were killed. Because the bodies of Lakota people were pushed into mass graves, and many were hunted down as they ran away from the scene of the main gunfire, it is impossible to know the total number of people who lost their lives on December 29, 1890. Telegrams leading up to the attack, however, suggest that the number of people camped by the creek may have been close to 400. On December 28, 1890 at 9:35 pm, General Brooke wrote to the Assistant Adjutant General of the Department of the Platte, “Have a train at Rushville for four companies of Second Infantry and at Gordon cars for three hundred seventy Indians and their plunder. This train must move in one body if it takes two engines. The transportation which came from Omaha will go with the troops. The train should be at Rushville on the thirty-first, ready to load and then pick up the Indians at Gordon.” About an hour later, Brooke corrects his earlier telegram and requests that the train be at Rushville by the 30th. 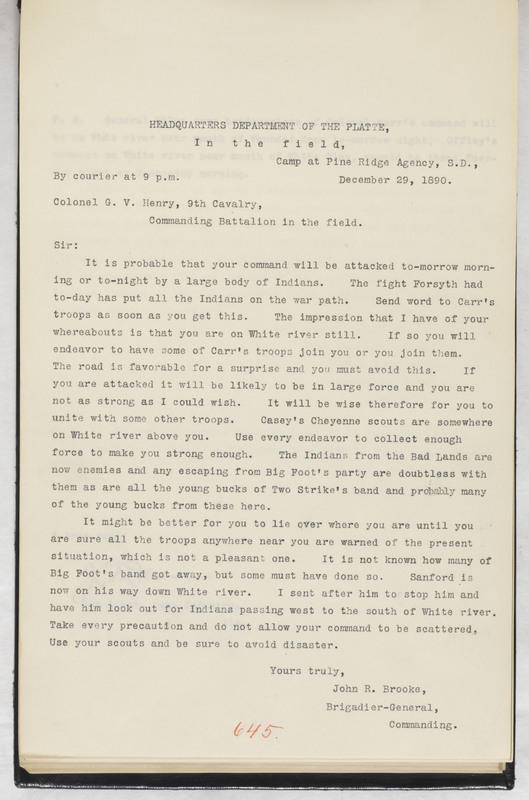 Another telegram, this time from James W. Forsyth, Colonel of the 7th Cavalry, reports that conditions at Wounded Knee were “perfect.” Forsyth continues, “[t]he Commanding General’s orders will be carried out in the morning, and as soon thereafter as possible I will report back to him with the battalion I brought out with me. Rations for 400 Indians should be sent here to-morrow as early as possible with the forage train the General said he intended to send.” It is unclear from the correspondence the nature of the orders Forsyth planned to carry out. Brooke’s response is detailed: “Forsyth says there were one hundred and six bucks and about two hundred and fifty squaws and children. The bucks were accurately counted, the squaws and children were estimated. Six badly wounded bucks are here [at Pine Ridge], six wounded bucks with a party of twenty-three bucks and squaws which Captain Jackson had to drop when attacked by the Brules. Sixty-two dead bucks were counted on the plain where the fight commenced and on other parts of the ground were eighteen more. This does not include those killed in ravines where dead bucks were seen but not counted. … The squaws and children broke for the hills when the fight commenced and comparatively few of them were hurt and few brought in.” Brooke goes on in this account, but it seems clear that his estimates of the number of women and children killed were much lower than the actual numbers. There are many more telegrams exchanged over the course of the next few days, with more captures of Lakota reported. The correspondence in the Brooke papers details much of the aftermath of Wounded Knee, and follows Brooke’s military career as he helped to craft policy in the Department of the Platte, as well as Puerto Rico and Cuba. I hope that with the improved description of this collection, these papers will offer another perspective on U.S. military policy during the Indian Wars and the campaigns that followed.